I have climbed aboard the indie polish train, and I'm staying for the ride. I have even dedicated a drawer in my Helmer to my indie polishes only. That's serious business. There a few of my Helmer drawers that share space with other brands, but the indies have their own drawer now. I even set calendar alarms on my phone for when etsy shops restock. I have a problem. I admit it, but I can honestly say I've never been this excited about nail polish before. Go indie polish ladies! Anyways, this is one of the pretties I picked up from Dollish Polish when she reopened last. Random Dancing is a mixture of multi-colored micro glitters, medium hex glitters, and large square glitters in a clear base. 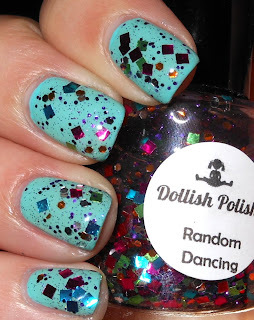 I do not own any polishes with square glitters, so I was super excited about Random Dancing. It's definitely a birthday party in a bottle. I love the variation of color and sizaes in the glitter. This not your "been there done that" DL Happy Birthday, Milani Gems, and every other dupe to that type of polish. Random Dancing is definitely unique and special. The formula on this was easy to work with. You will not be fishing out glitters at all. The glitters are very willing to stick to your pretty nails! Overall, this polish rocks! This is gorgeous! Can't wait til she reopens her shop again, I think I need to have this one! This is such a pretty glitter. I've been on an Etsy kick too. I try to stay away, but I'll be visiting their site now ;0). Dollish is really got it going. I could see if they got the capitol together, building a non etsy business going. I bet if etsy existed when Maria started Cult, that would have been how she would have got up and going. It's a great profile to show for a business loan to take things to the next business level. I surely do appreciate all the bloggers who take stabs at the etsy companies and let it out about who is great. There's so much there now. Hard to sort thought them - esp when some just might not be good with the camera or not have a good bottle label. It all reflects on the product that might be great or might be a dog! I'm hoping aboard the Indie train now...just placed a Pretty & Polished order. So pretty! I love the big chunky glitters. I am also becoming pretty obsessed with indie polishes; although I keep missing the e-mails telling me when things are back in stock or not being quick enough on the draw to actually get them. I'm definitely going to keep trying though because there are some amazing polishes out there. I've even been inspired to try my hand at coming up with some creations of my own. How do you order this nail polish??? This is one of the coolest polishes that I've seen. You really don't see many lacquers with square glitter. It looks amazing over Aquadelic! Steph, do the large square glitters feel sharp at all? Or does a good, thick top coat smooth it out pretty much?